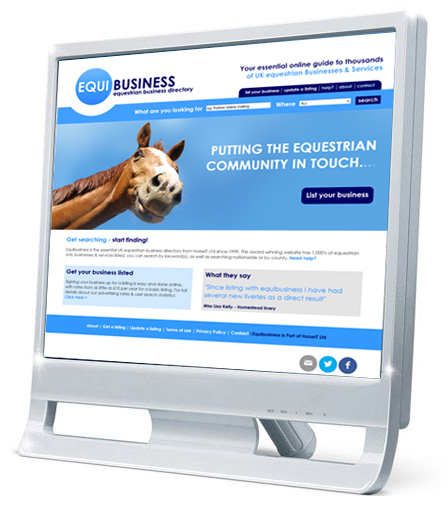 Equibusiness - horse equestrian business directory equine business directory for all horse related services. With so many businesses now online, Equibusiness enables you to target your company & services to a dedicated community and not just on a general search engine, listed with every other type of non equine listing. There are three listing options, starting with the basic for £10 per year, so you can choose what advertising level gives your business the best exposure. Enhanced listings (COLOURED & LOGO), appear above all BASIC listings in the search results & have more detailed information including multiple images, your company logo and video. You can also then list your company in up to six business categories (only 1 for BASIC). For example, if you searched for "Stables" or "Stabling" - Scotts of Thrapston's listings appears at the top of 508 search results with its LOGO listing.